How the picture comes together from an idea to the finished painting. In any picture, the idea is the most important aspect to ensuring a interesting painting, it must resonate with the viewer almost instantly. The idea for Drop Zone: St. Mere Eglise had been in my head for years. Prompted by a friend's request, I drew up the sketch below. There is no research, just the general idea roughly drawn. This helps preserve the thought and its merits discussed and evaluated. Research for a painting takes several forms, consuming many hours of historical detective work. The painting must contain everything that should be in it and nothing that shouldn't and must be painted as if you were there regardless of when and where the picture is set. The artist is responsible for all aspects of the picture; ultimately his name is on the final product. The telling of someone's story and making the effort to obtain as much information as possible is crucial in depicting the event accurately and skimping on the research almost always comes back on you. 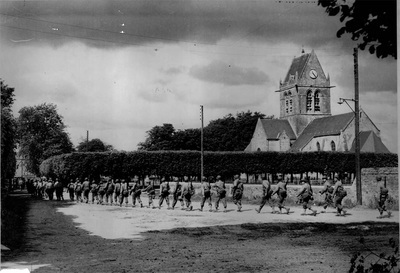 One starting point for this painting was available WWII photographs such as the three shown above. 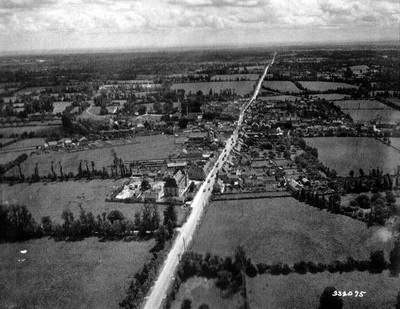 Examining them against the modern photographs of the town allows you to note the changes that occurred following the war. Why spend so much time doing research and building the village? The answer is when a WWII veteran like Spencer Wurst points to a cluster of trees at the edge of town and says we buried 9 paratroopers in parachutes right here, or when Jim Rigas picks out a house next to the church and says this is where I picked up a Nazi flag and brought it back home, it makes all the hours worth while. The idea was to feel as if one was just a couple of hundred feet in the air coming down into the courtyard of St. Mere Eglise. 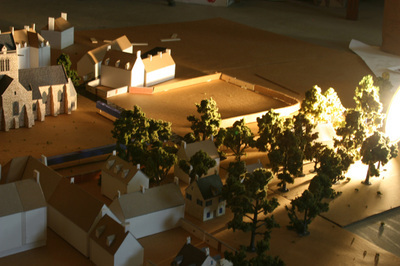 Going to France and flying around the town in France wasn't financially practicable, nor would doing so provide me the appropriate lighting, a miniature town was constructed in my basement, allowing me the freedom to decide the height and angle best suited to bringing the viewer into the scene. 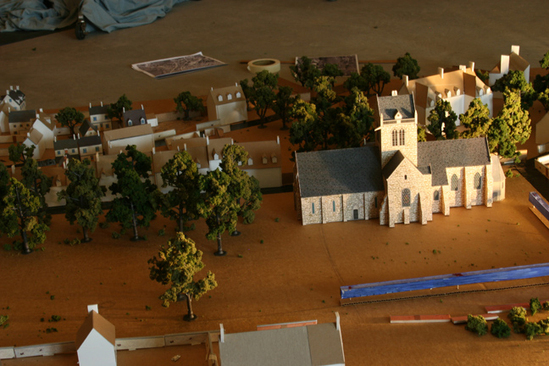 The church and a few of the buildings are a paper model my friend Greg Perry built. The other (white with brown roofs) buildings were constructed by myself. 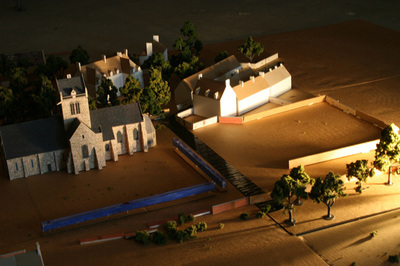 There are certain, distinct structures around the church I needed to replicate and a box kit of general buildings were not going to work. The trees were from a model rail road store that you had to assemble and glue together. There is a mathematical formula for light fall-off at night, but that is a linear formula and did not fit into the perspective of height. 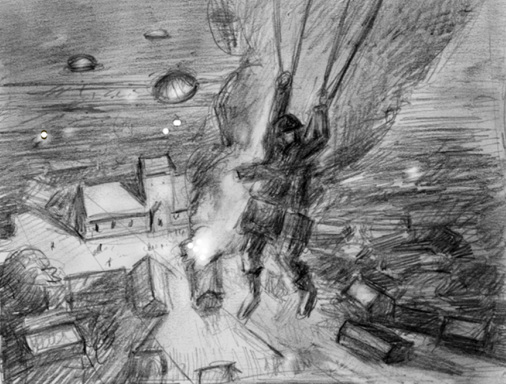 To determine the correct perspective, experiments were done simulating both moonlight and firelight as shown below. There were also parachute experiments. The fabric of a parachute is translucent--what would it look like when firelight struck it? The collapsing parachute and chutes in the trees didn't really work out as I had hoped because it was constructed out of rubber tubing cut in two then glued together to form the parachute sections. 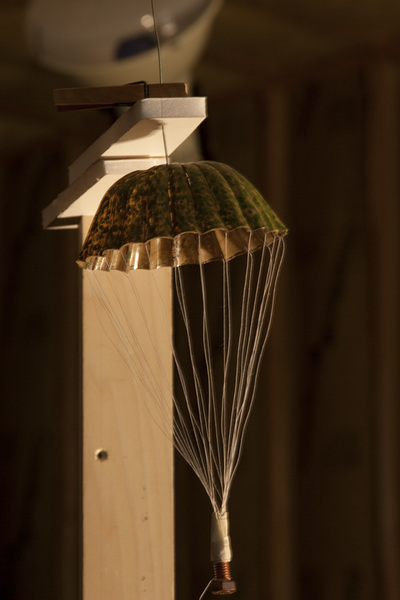 I abandoned using the photos of the collapsable parachute as accurate enough to work from. 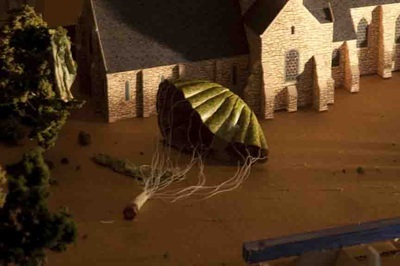 The model dressed in full paratrooper kit, including a packed parachute was supposed to look suspended in the air but how? He needed to be slightly off the ground to photograph from above but not too high in case the harness holding him slipped. 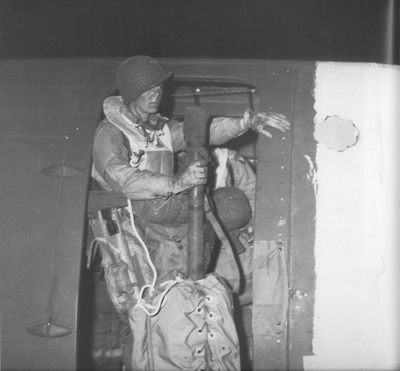 There was a lot of weight to deal with; the pack tray for the parachute was still loaded, and the weapons plus equipment added about forty to fifty extra pounds which his shoulders needed to support. On top of that, he still had to get into the pose and hold it, no easy task. Shooting it in a garage in summer added to the short-term misery the model had to endure. My model, Dave Mackley, is ready for his ride into St. Mere Eglise, or at least the simulated town. 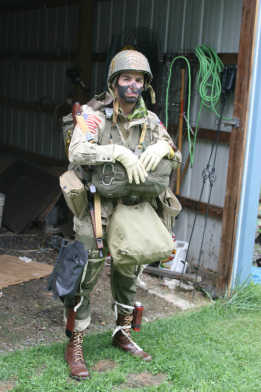 Paratroopers are light infantry and it is important to carry as much as possible into battle even if it wasn't your weapon. Their pockets and bags were stuffed full of everything possible. A man boarded the plane around twice his own weight, and was then expected to jump out, land and fight. It is no wonder these men were possibly the most physically fit in the American army. Here is Dave suspended in one of the positions for the main figure. A flood light was placed off to the side and a sheet behind him, giving me as clean a background as possible.The darkness of the garage helped control any extra unwanted light. During the drop into St. Mere Eglise there were two light sources: the main light was warm from the fire of a burning building just past the edge of the picture right side, while the secondary light from the moon is cool. A bucket was placed under his foot so he could rest in between takes and allow him some stability if he wanted to put a toe down and center the weight. 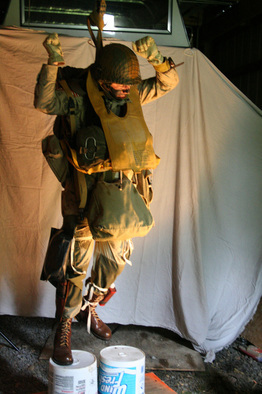 He was limited in range of motion because of the equipment and fully loaded parachute, pushed his head forward and the weight made poses hard to hold for long. It is assumed that everyone wore the life vest under the harness and that the equipment was all worn the same way. 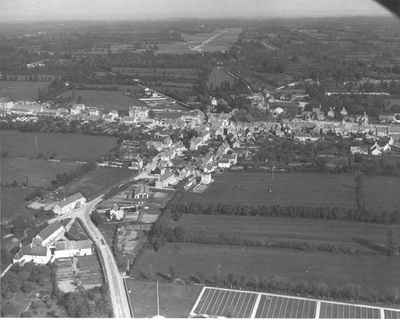 By studying photographs below of the Marshaling yards in England prior to the jump you can see that that is not the case.The 505 PIR had three previous jumps and learned the hard way not to wear the reserve under the harness. Deploying the life preserver would crush a man's chest because it could not inflate out against the thick harness straps. Most of the 82nd and a few of the 101st wore it over the reserve. 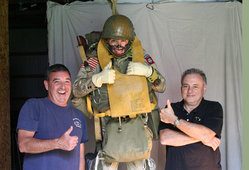 Model Dave Mackley hangs next to my prop and historical fact checkers Lt. Col. ret. James McCloskey (left) and "Big Joe" Ranoia. Lt. Col. McCloskey served 26 years in the US Army, 82nd Airborne. 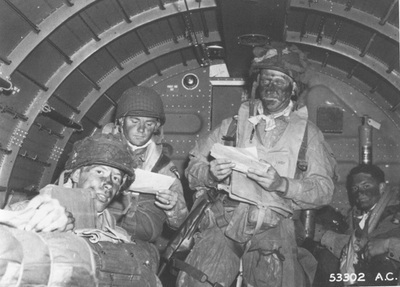 Joe Ranoia an extensive Airborne collector for over 30 years was a large contributor to the book Geronimo.